They were playing on Monday Night Football. And he was in Scranton or Richmond or Durham or wherever it was, playing baseball after having foregone a chance to play quarterback in the NFL. Drew Henson was Kyler Murray before Kyler Murray. And as Murray’s impending early entry into the NFL draft following his Heisman Trophy-winning season at Oklahoma further complicates his football vs. baseball decision, the stakeholders in his career are trying to better understand the true strength of each sport’s allure. 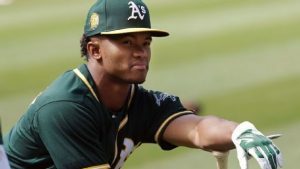 This is the power of Kyler Murray, an athlete whose dynamism convinced the A’s to spend the ninth pick in the draft on him with fewer than 250 college at-bats to his name, a dynamo whose athleticism didn’t just allow him to function while standing behind an offensive line at Oklahoma that averaged 6-4½, but turn in an all-time-great season with 4,361 yards, 42 touchdown passes and just 7 interceptions. It is good to be loved, and Murray has dual — and dueling — paramours with boundless ardor. The only question is to whom Murray will reciprocate. Whichever path Murray chooses between now and the Feb. 15 report date to A’s spring training is potentially rich with fulfillment, success and money. They are also wildly disparate.